The 2015 YZF-R1 And YZF-R1M | Throttle Life! When the Yamaha YZF-R1 debuted in 1998, it was called a “game-changer.” The term “R1” entered the motorcycle lexicon and became synonymous with the pinnacle of Superbike performance and racing success. 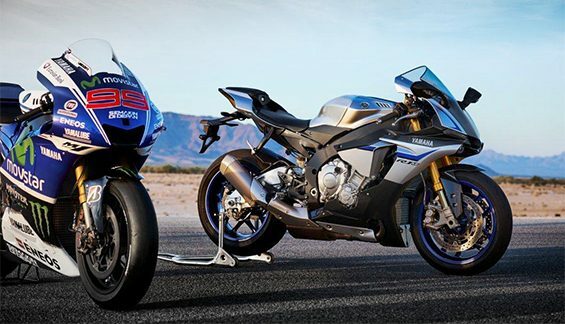 For 2015, Yamaha introduces two all-new R1 models that promise to make as big of an impact in sportbike and road racing circles as the original R1 did nearly two decades ago. The 2015 R1 and limited-edition R1M are both highly advanced, distinctive, and paradigm-shifting motorcycles. The all-new 2015 R1 was conceived, designed, and built to showcase Yamaha’s engineering and performance prowess, and the advanced features of the bike are destined to make it not only a success on the racetrack, but also a superior performer on the street. Featuring the first six-axis Inertial Measurement Unit (IMU) ever featured on a street-going motorcycle, the 2015 R1 represents the dawn of a new digital era where all riders can experience total 3D controllability. Fully equipped with banking-sensitive Traction Control, as well as Slide Control, Anti-Wheelie Control, Quickshifter, Launch Control, ABS, a Unified Braking System, and much more, the all-new R1 gives street riders, track day participants, and full-on racers an unmatched and unprecedented level of rider-adaptive performance. For the first time, all riders have the opportunity to experience MotoGP-winning YZR-M1 technology previously only available to Yamaha Factory Riders Valentino Rossi and Jorge Lorenzo. The 2015 R1 features a completely new, lightweight and compact, crossplane-concept, inline-four-cylinder, 998cc engine that delivers high horsepower and a strong pulse of linear torque for outstanding performance. The R1 has twin injectors fueling each cylinder. A bi-directional spray in the lower injectors directs fuel toward the back of the intake valves to maximize the number of droplets that go directly into the combustion chamber and, at high RPMs, the secondary injectors add a boost in fuel delivery. Among the many innovative, breakthrough features on the new R1 engine are titanium fracture-split connecting rods, which are an industry first for a production motorcycle. The specific titanium alloy used to manufacture the new con rods is around 60% lighter than steel, and this major reduction in weight gives the new R1 engine an extremely responsive and potent character at high rpm. And, speaking of titanium, the 2015 R1 is equipped with a newly designed exhaust system manufactured mainly from titanium. Plus, a compact, midship muffler contributes towards the mass centralization that is a key feature on the R1. A brand-new Deltabox aluminum frame was designed and developed for the 2015 R1. The engine is incorporated as a fully stressed member and is mounted rigidly to the frame at four points. Also, an upward-truss-type aluminum swingarm create an immensely strong and lightweight structure. The new short-wheelbase chassis benefits from weight-reducing features such as a magnesium subframe and–another first on a production motorcycle–magnesium wheels. Also, an aluminum fuel tank is 3.5 pounds lighter than if it were made from steel. The M1-inspired fairing on the new R1 is equipped with LED headlights and position lights, which not only provide weight savings but also deliver high luminosity and style. Two small-diameter LED headlights are positioned on either side of the central air intake and, because of their compact design, they appear to be virtually hidden in the new fairing. In addition, twin-LED linear position lights located within the front fairing give the R1 a truly unique frontal expression. And, for added style, when the ignition is turned off, the LED position lights gradually lose their luminosity as if the bike is gently going to sleep. The all-new 2015 YZF-R1 will be available in three distinctive color options–Team Yamaha Blue/Matte Silver, Rapid Red/Pearl White, and Raven–and will retail for $16,490, with bikes available in dealerships beginning in late February 2015. From the beginning, Yamaha has always faithfully adhered to the mantra, “We Race. You Win.” And the YZF-R1M is arguably the truest and most direct representation of that belief. As much as the 2015 R1 bristles with performance, style, and race-bred substance, the R1M actually kicks things up yet another notch, giving you a production Superbike that’s as close as you can get to a street-legal M1 MotoGP bike, effectively blurring the line between the two. The R1M showcases an additional range of highly sophisticated components–including Öhlins Electronic Racing Suspension (ERS), carbon fiber bodywork (upper fairing, side fairings, and front fender), and a Communication Control Unit (CCU) with GPS that enables the rider to capture ride data (including GPS tracking) and then download it via WiFi to the Yamaha Y-trac smartphone and tablet app. Once the data is downloaded, the rider can analyze it overlaid with the track map, make setting changes, and upload those changes back to the R1M. The R1M’s specially developed tires are the result of a joint collaboration between Yamaha and Bridgestone. The 200/55-ZR17 rear tire and 120/70-ZR17 front tire use a special compound formulated to optimize the performance characteristics of the R1 and allow the rider to experience outstanding levels of traction with extreme lean angles. Additional R1M features include a clear-coated aluminum fuel tank, a highly polished aluminum swingarm, gold-colored front radial-mount calipers, specially finished gold inner tubes on the 43mm Öhlins front forks, and a special R1M badge on the airbox cover. After riding this Superbike taken to the Mth degree, four-time AMA Pro Superbike Champion Josh Hayes said, “If you’ve ever ridden an R1–or any literbike for that matter–chances are, you’ve got a secret wish to swing your leg over a full-on, race-ready Superbike. Well, with the R1M, now you can. Since the R1M is intended for professional racers and highly experienced riders who demand the ultimate in track performance, less than 500 of the limited-edition model will be available in the U.S. beginning in late February 2015. Offered in a first-of-its-kind Carbon Fiber/Liquid Metal color scheme, the R1M will carry a suggested retail price of $21,990.